Question: Why use Dr. DecknFence ? to the wood) and professional grade, state of the art equipment, to get the job done right the first time! Question: What makes Dr. DecknFence different? Answer: What we do is to make your outdoor wood looks its best with the least amount of aggression to the wood and with specialized environmentally friendly solutions. Question: Are your solutions really “Environmentally Friendly”? Answer: The solutions we use are developed to do an exceptional job in preparing your outdoor wood for refinishing, while being safe for the environment! Where others use caustic strippers, we are family owned and operated and believe in doing things the right way! Question: What is your warranty ? Answer: We offer a two year warranty, against cracking, chipping, and peeling of our stain and sealer. Question: How do I get an appointment ? Answer: Simply call your local Dr. DecknFence dealer and we will be more than happy to get you on our schedule! Question: Do you do repairs as well? Answer: Yes! We can insert a section of wood missing and stain it to make it unnoticeable! Question: How do I get an estimate ? Answer: We are more than happy to give you a quick estimate over the phone (simply measure your project and give us a call!) or we will make an appointment to come out for a free consultation. Question: My deck has a lot of splinters Will this help? Answer: The Dr. DecknFence proprietary stain sealer will bind with the wood and reduce splintering dramatically. All wood is different and may react differently with service. 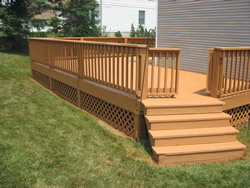 But we have refinished decks with terrible splintering problems and totally eliminated the problem!